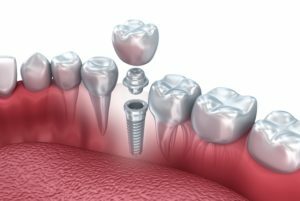 Dental implants are titanium screws that are placed into your jawbone to support a dental prosthesis, such as a dental crown. They can be used as a dental restoration for a single tooth, as well as for an entire smile. 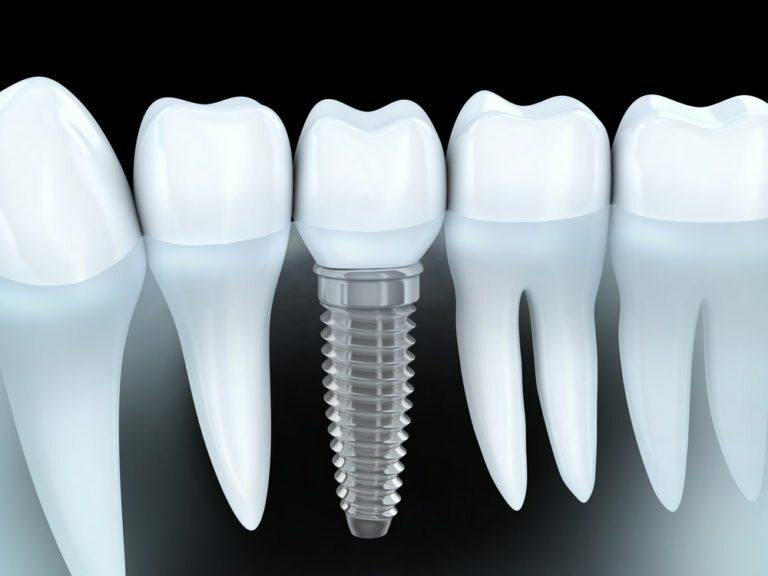 Dental implants are recommended by many dentists for their strength, durability, and permanence. The most commonly used type of dental implant is the endosteal implant, which utilizes a titanium screw fused to the surrounding jawbone. However, there are also dental implants that sit above the jaw bone and beneath the gum line. These dental implants are known as subperiosteal and are not as common, nor as strong. Nevertheless, both types of dental implants can be used to restore your smile. Although modern dental implants have been successfully implanted in the last 30 years, dental implants can actually be traced back to as early as 600 AD. Back then, Mayans would use tooth-shaped pieces of shell embedded into the jaw. Luckily, the dental implant procedure of today is much easier and far less painful. However, there are other factors that must be taken into consideration, such as your dental and overall health, as well as your bone mass. To find out if you are a good candidate for dental implants, schedule a consultation with Dr. Scott Simpson of Appletree Dentistry today! Can I still get dental implants if I don’t have enough bone mass? If you do not have the proper bone mass for an endosteal implant, you may be able to opt for a subperiosteal implant that sits above the jaw bone rather than in the jawbone. However, subperiosteal implants lack the same strength as endosteal implants. If you want endosteal implants but are lacking the proper bone mass, there are some options. The most common option is to undergo a bone graft. A bone graft is a surgical procedure that takes bone material and places it in the area lacking bone mass. 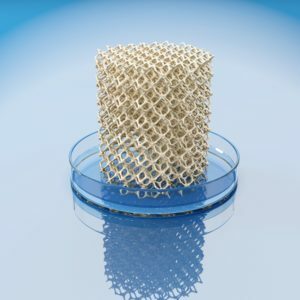 This material can be harvested from your body, artificial bone material, or taken from a cadaver. Once the new material is placed in the affected area, new bone will start to grow and replenish your bone mass so that a dental implant can be placed. Additionally, a sinus lift or ridge expansion may be performed. What can I expect when having dental implants placed at Appletree Dentistry? When you have dental implants placed at Appletree Dentistry, Dr. Simpson will first properly sedate and anesthetize you to maintain your comfort. Once you are comfortable, a small incision will be made in your gums to access your jawbone. A tiny titanium screw will be embedded into your jawbone. An abutment, or connector piece, may also be attached at this time. If so, this abutment will protrude above the gum line once your gums are sutured up. Once the dental implant, or titanium screw, has been placed in your jawbone, it will need to undergo an essential healing process called osseointegration. During this process, which takes several months, the surrounding jawbone will fuse to the dental implant, essentially anchoring it in place. This process is essential to guarantee a strong and functional dental implant. After your dental implant has healed and the surrounding bone has completely fused around it, you can prepare for your final restoration to be placed. Dental impressions will likely be taken of your mouth in order to fabricate a custom restoration. Once your restoration has been fabricated, it will be mounted on the abutment piece. What can expect after having dental implants placed at Appletree Dentistry? After having your dental implants placed at Appletree Dentistry, you may be given a prescription for pain medications and/or antibiotics, or instructions on how to use over the counter pain medications. It is important to take all medications as directed to manage any pain or discomfort after your procedure. Additionally, you can use ice packs for 15 minutes on and 15 minutes off for the first two days to help further alleviate swelling and discomfort. You will also have some temporary dietary restrictions after having your dental implants placed. Immediately following your implant placement procedure, you will need to eat cool, soft foods and avoid anything hot in temperature or spicy in taste. After about the first two days, you can eat warm foods, but should still avoid spicy foods. Until your implants have become stable, you will need to be on a soft foods diet consisting of foods like pasta, applesauce, yogurt, cottage cheese, steamed veggies, scrambled eggs, mashed potatoes, and fish without bones. Dr. Simpson will let you know when you can gradually move up to harder foods. Dental implants can last anywhere from 10-20 years, sometimes longer, if properly cared for. Compared to other dental restorations, dental implants offer the longest-lasting restoration method. To properly maintain your dental implants, you will want to care for them like you would your natural teeth. This means twice daily brushing, once daily flossing, and regular dental checkups and professional teeth cleanings at Appletree Dentistry once every six months. The average cost for a single-tooth dental implant is about $1,500-$6,000. This cost includes the implant, abutment, and the permanent restoration that is attached to the dental implant. While dental implants do have a high upfront cost, they are the longest-lasting restoration method and will have fewer maintenance or replacement costs in the long run. Also, if you have dental insurance, you may be able to obtain partial coverage to help offset this initial cost.